Qualcomm expects mobile data traffic to jump massively by 2020, with the chipmaker anticipating a 1000x growth. It might not sound like the company's core remit, but data networks and how they play nice with hardware are a key consideration, and Qualcomm's president and COO Steve Mollenkopf says it is pumping the R&D department hard. For Qualcomm, facilitating that massive data growth is all about small cells; rather than hundreds of pricey, unsightly and logistically nightmarish mega masts, the company thinks that smaller stations and thousands of them is the way forward. "We have a vision where the topology of the network and the way cells are deployed will be vastly different," Mollenkopf said, speaking at Innovation Qualcomm Berlin 2012. "We want to see small cells everywhere – and it's possible because they can be as small and cheap as a phone." You might be familiar with the concept of a femtocell; a small wireless data station that improves mobile reception in dry spots around the home. Femtocells are just one kind of small cell transmitter, with picocells, metrocells and microcells other iterations for use in bigger institutions and rural areas. 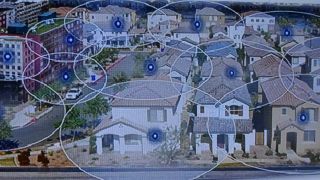 Qualcomm envisages a kind of community network; it wants mobile networks to provide customers with a femtocell as standard (something the company just happens to make and will sell you for around $100), with the idea being that each household keeps access to their cell open. That gives a whole extra layer of access to the same spectrum provided by the big masks, and data should be able to travel faster because you're not fighting to get through a bottlenecked mast-transmission against hundreds of other users. Instead, you and people nearby are accessing the spectrum via the femtocell layer. "We want to take the technology available on phones and apply it to the base station world," Mollenkopf explained, speaking from beneath a visual of a chipset smaller than a pack of playing cards. But this growing network of smaller transmitters won't just work with your smartphone. "Everything is going to be connected in multiple ways – not just mobile devices but washing machines and cars – through Wi-Fi, powerlines, homeplug greenphy and more. We have to make sure that the right tech is available at the right time to get data on and off devices. "At Qualcomm we're big believers in small cells; but there's still a lot of innovation needed. We need to figure out low-cost cell sites, interference management, how to ensure that devices side-offload at the right time and so on," he warned. "But this 1000 times growth is a big priority for our 10 year vision." Although Qualcomm's femtocell base stations are 3G only at the moment, a spokesperson told us that the company is hard at work on the chip to handle 4G and LTE services too.